Imagine a clear jug to which is added a mixture of different colored dyes until the bottom of the jug contains a dark murky mixture. Then imagine pouring pure clear water into the jug. As the pure clean water is added to the vessel it dilutes the murky mixture. The more clear water is added to the jug, the clearer the mixture becomes – until it has no more tint from the dye. Affirmations work in much the same way; they act like the clearing agent being poured into the jug to dilute the mixture of murky thoughts, beliefs, erroneous words, and negativity swilling around in our consciousness. This is a helpful analogy to bear in mind if, while stating an affirmation, we experience resistance that says, “I don’t believe this,” or “this isn’t true”. Just remember… it’s simply a clearing process to replace the negative with the positive. Affirmative prayer can be a really powerful tool to use – not to cajole, beseech, or impress a God of our understanding, but to change our perception of a situation and any false beliefs, or limiting ideas we may hold about it or ourselves. Prayer changes everything –because it changes us! Affirmative prayer treatments are designed to support us with whatever situation we may currently be experiencing. Remember to declare your chosen affirmative treatment and the associated stand-alone Power Statements with feeling and passion, until you feel the words vibrating in your body. Repeat them often to dilute and replace any negative ideas, beliefs, or behavior patterns you may inadvertently be holding in consciousness. Personalize the statements, adjusting and tweaking the wording as necessary, to make them your own. Each month we feature a Dynamic Prosperity Decree which you’re encouraged to use before you “Donate” where you have been spiritually fed or have witnessed spiritual principle in action. We’re featuring it here for you to decree and perhaps consider affirming before sharing your financial gifts, wherever it is that you have decided to tithe or donate this month. and enhances my capacity to receive gracefully. "I am ready for a miracle! By quietening my mind and pursuing a right relationship with my Creator, all that is for my highest good falls into place. As I marinade in a time of stillness, great and grand applicable ideas express in, through, and around me now. I boldly speak these ideas into existence with positive words that resemble my unshakeable faith in the very Truth’s expressed. Anything that no longer serves me—from the mental to molecular level of my being—is flushed out and, through the power of positive prayer, shifts to its spiritual equivalent. Such love, such goodness, such beauty, fearlessness, and joy exudes from me in support of my intention: To move through my world as a healing presence of love. Therefore, I know and experience myself as a clean, clear, conduit for Divine Love, whose realigning energy flows, unimpeded, through me now. I know and experience myself as a vibrational match for the pure expression of Divine Light’s resplendence. It reflects from me as clarity, honesty, integrity, and radiance. I know and experience myself as unlimited. Blessings of good show up as calm in my mind, health and wholeness in my body, abundance and success in my affairs; and bountiful opportunities that propagate my goals and dreams. Yes! I am ready for my miracle — inside and out! And so it is. Amen." 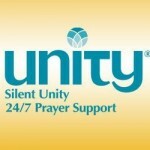 If you would like to pray with someone in person, feel free to connect directly with Silent Unity. A Prayer Associate will be happy to pray confidentially with you on the telephone regarding any matter. Call: 1-800-NOW-PRAY (1-800-669-7729). This confidential prayer line is available 24 hours a day.